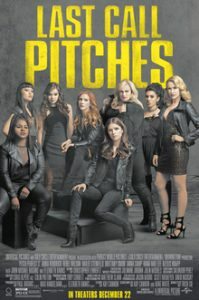 Starring Anna Kendrick, Rebel Wilson, Brittany Snow, Anna Camp, Hailee Steinfeld, Ester Dean, Hana Mae Lee, Elizabeth Banks, John Michael Higgins, Ruby Rose, and John Lithgow. When Pitch Perfect came out in 2012 nobody, including myself, was expecting too much from the film based upon the trailers. To our surprise it ended up being much better than anticipated and went on to be both a critical and box office success. It did so well at the box office that it spawned a sequel in 2015. This wasn’t quite as well loved as the original but it still struck a chord with most critics and audiences enjoyed it so much it went on to gross more than double what the original was able to bring in. Now we arrive at the third and supposedly final film in the franchise, which might be a good thing because this one feels like they are running out of steam. The Barden Bellas are back after winning their world championship in the previous film. They’ve all gone on to bigger and better things, or at least that’s what they all hoped for. After reuniting for a get together the Bellas decide to go on one last singing competition because they know they are all at their best when they are with each other. They join a competition overseas at a USO tour where the winning group will get to open for DJ Khaled. This isn’t an easy task as the Bellas face groups who play actual instruments instead of singing acapella. One thing that this franchise has been able to coast on is the chemistry between all the girls who make up the Bellas. They all are basically playing stereotypes but they work together and you can see how much fun the actresses are having. Another strength has been the song performances and here it’s no different with an array of new songs and even new characters getting a chance to shine and show what they’ve got. Everyone in the cast does a great job once again with Anna Kendrick and Rebel Wilson still leading the pack but we still get scene stealing moments from the likes of Ester Dean, Hana Mae Lee and even John Michael Higgins and Elizabeth Banks revive their hilarious duo of John and Gail. Now while the film does a lot to entertain and give fans of the series plenty of what made the first two films so good is also one of the biggest downfalls here. There is nothing new and it feels like the filmmakers were running out of ideas at times. Fat Amy has a subplot dedicated to her and her father, played by John Lithgow, that almost single-handedly ruins the entire story. Had it been just a minor piece that would have been no problem but it ends up being a huge part of the film which feels way too unnecessary with everything else going on. The story has too many subplots to keep up with. 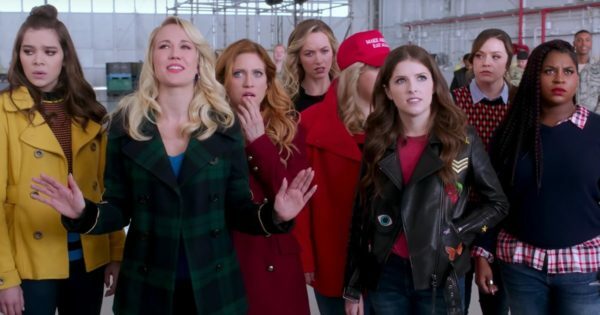 Where in the first two films it felt like Becca’s story, the Bellas story and a dash of Fat Amy, this time it feels like everyone has their own story and it’s too much for an hour and half film. In the end, Pitch Perfect 3 should have been a better finale for this great group of girls. While there are plenty of moments to enjoy, there are lots that will have you rolling your eyes or awkwardly laughing because you’re not sure if the scene is supposed to be funny or not. Also, it would have been nice to see the Treblemakers make a return but I guess there was already too much going on. If you’re a fan of this franchise you’ll more than likely have a great time but this finale will not gain the series any new fans.